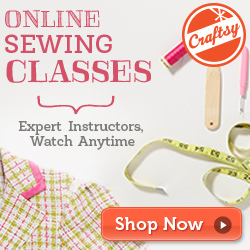 For all you SEAMSTRESSES and CRAFTERS, a pincushion that stays with you! No more scrambling and searching for your pins when you need them. At the cutting table, sewing machine, dress form or anywhere else you are crafting, you can now have your pins, needles and safety pins accessible at all times. So comfortable to wear, this pincushion will put no restrictions on your movement or sewing performance. I just love mine! A fun easy project you can whip up in no time. The pattern has easy to follow instructions and photos. There are 3 different wrist pincushions and 1 stand alone cushion pattern included.